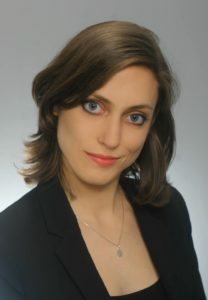 Magdalena Wdowicka-Mackiewicz is a graduate of the School of Music in Poznań, in the class of choral conducting led by Professor Stanisław Kulczyński. She is a double prize winner of the All-Polish Choir Conductors Competition (1992 – 2nd Prize, 1994 – 1st Prize). In 1994 she was employed by the School of Music in Poznań, at the Faculty of Choral Conducting, Musical Education, and Church Music, where she still works as a professor of choral conducting. Since October 2012 she has been the Head of the Department of Choral Conducting. So far twenty two students graduated from her class. The vast majority of them work with their own choirs as well as musical ensembles, both professional and amateur. Magdalena Wdowicka-Mackiewicz has been cooperating with many choirs and orchestras, including the Choir of School of Music in Poznań, baroque orchestra “Arte dei Suonatori” and orchestra Collegium F, with whom she prepared vocal and instrumental pieces of J. S. Bach, D. Buxtehude, W.A. Mozart, C. Orff, A. Pärt and others. Magdalena Wdowicka-Mackiewicz specialises in the performance of Renaissance and Baroque music. As a lecturer, she takes part in science sessions and conferences. She has been a jury member in choir competitions (including Concorso Internationale di Canto Corale in Gorizia) and has run choir workshops. A member of European Choral Association Europa Cantat. The artistic activity of Magdalena Wdowicka-Mackiewicz is primarily focused on Dysonans Chamber Choir. She has been the Choir’s conductor since 1991. With this ensemble she won a lot of significant prizes in choir competitions in Poland and Europe. She was honoured for her activity with the Bronze Cross of Merit (2007), the Medal of the National Education (2013) and the Silver Medal for Long Service (2017). Edyta Muchowiecka graduated from the Music Academy in Poznań, obtaining Master’s degree specializing in Rhythm and Choral Conducting in the class of prof. Magdalena Wdowicka-Mackiewicz. She is a member of an ensemble Discors Concordia specializing in performing early music. She is working as a teacher in Music School complex in Poznań, as well as in Jerzy Kurczewski Choral School in Poznań, where she leads Children Choir “Little Cuckoos”. She is an award winner of several composition competitions. She’s been working with the Dysonans Chamber Choir since 2013, and in July 2016 became the second conductor of the choir.